Basement waterproofing is one of the best ways to protect your home, your family and your possessions. Water is one of the most destructive elements. It erodes mortar, saturates woodwork and creates the ideal breeding ground for mold spores and mildew that can endanger the health and well-being of your family. Get help now. Call MCF Construction. As the foundation of your home, the structural integrity of your basement is critical to the overall stability of the house. If you have noticed the smell of dampness, water marks on the walls, or puddles gathering on the floor, contact our basement repair experts today. Basement waterproofing will increase the value of your property, protect your investment and safeguard your family’s health. 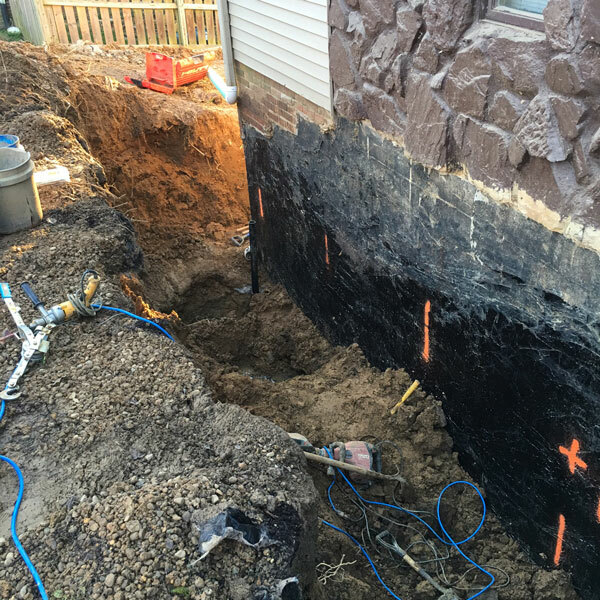 We are certified by the National Association of Home Builders and the Southwest Indiana Builders Association to address all your underground problems. Water can enter your lower level from a number of locations and for a number of reasons. Cracks in foundation walls and slabs are usually quite easy to spot. However, basement waterproofing often requires much more than simply applying an interior sealer to the cracks in the walls and floor; there are many other components of your cellar that can be contributing to its dampening. Foundation walls built below the grade of the soil that surrounds them will allow rain, melted snow and flood waters to flow over the top of the wall and into the cellar. We are certified in basement sealing. Window wells and exterior doorways built without drainage systems, or built with drainage systems that have clogged over time, cause water to pool and then leak through to the interior. We do expert water leak repair. Broken or inadequate sump pumps can also contribute to moisture infiltration. These pumps were designed to keep water flowing out of below-grade space. They protect the underpinning soil of the foundation from saturation and erosion. You will wind up with pools or puddles if the pump breaks down, or if you have installed a pump that is not strong enough to handle the volume of water that gathers at the base of your home. Basement waterproofing may also be necessary due to the materials that were used to build your foundation walls. Cinderblocks, bricks and stone foundation walls are installed using mortar which is porous and erodes. Wooden walls leak because the material naturally decays with age. The trick to successful basement waterproofing is recognizing symptoms. Your basement may be dampening due to one or more problems, so we always perform thorough inspections before we develop remediation strategies. This way, you have a clear understanding of the issues that you are facing and the measures that must be taken. We use a variety of methods and materials to do basement waterproofing, and we can solve any moisture issues you may be having. Geo Channels are used to drain water from the yard. They lead water that has seeped to the room below into the sump pump. Cove Drains are used to relieve hydrostatic pressure and to lead water from wall leaks to drainage systems. Champion Sump Pump systems are used to ensure that water is quickly and effectively drained from the basement. Champion model pumps are also more energy-efficient and run more quietly than most other pumps on the market. Dehumidifiers are used when water damage repair has been completed. Dehumidifiers remove excess moisture from the air in your basement and also help improve the air quality in the home. If you have a crawl space, you know how damp and musty the bare-earth surfaces can get. We can completely seal it to stop moisture from seeping into the rest of the house and keep living space at a comfortable temperature. Basement waterproofing adds value to your home and protects your family from mold and allergens. It also gives you the opportunity to expand your living space. Many people avoid their basements because they are dark, dank and musty. However, with the proper use of drainage channels, Kozy Floor barriers and Bright Space wall liners, you can literally transform below-grade space into comfortable and usable square footage. If you would like to discuss basement waterproofing in Newburgh, Evansville, Boonville or other local cities, call our team of technicians today. We can handle every type of moisture issue and guarantee thorough and friendly service.